Women in Focus is an annual conference at Dodge College featuring a panel of the most prominent women in entertainment participating in an open discussion with students and the community regarding their experiences in the industry. 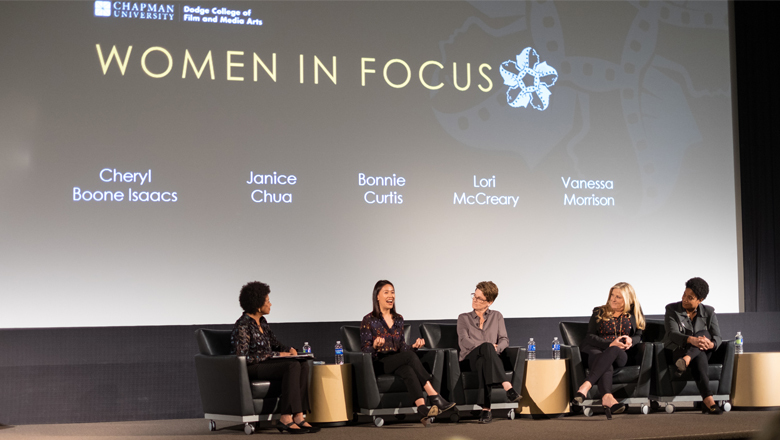 Chapman University's Dodge College of Film and Media Arts thanks the panelists, sponsors, and attendees of the 20th Women in Focus - your participation contributes to the continued success of this program. We couldn't do it without your support and involvement. Janice Chua Yuerong graduated from Ngee Ann Polytechnic, Class of 2008 with a Diploma in Film, Sound and Video (FSV) from the School of Film and Media Studies (FMS). In 2009, she enrolled in Chapman University Singapore, a private university that partnered with Ngee Ann Polytechnic which offered a two-year degree program in creative producing. While at Chapman, she got her first taste of Hollywood when she secured an internship in Los Angeles, California with Myriad Pictures. After Chapman, Janice moved to Beijing and started her career as an international executive handling sales, acquisition and co-production. She had worked on the international distribution of John Woo’s The Crossing. After a stint of overseas postings, Janice joined American production company Ivanhoe Pictures in 2015 just after it acquired the rights to Kevin Kwan's story - Crazy Rich Asians. She served as an associate producer on the film. To give the movie an authentic Singaporean flavor, director Jon Chu and the producers relied on Janice to scout for filming locations on the island to showcase Singapore. They also counted on Janice's inputs during the script development phase. While at Ivanhoe, Janice was also building a slate of local language content for Asia. Janice is currently the Vice President for International Development and Production at Imagine Entertainment & Television. Bonnie Curtis was born in Texas and graduated as Valedictorian from Abilene Christian University with a B.A. in journalism. She moved to Los Angeles with her first love in mind: film. Curtis immediately found production work on the films Dead Poets Society and Arachnophobia before being hired as Steven Spielberg’s assistant in 1990 embarking on what would become a 15-year professional relationship with the acclaimed director. After the films Hook and Jurassic Park, Curtis became a Production Associate on Schindler’s List and served as Associate Producer on The Lost World: Jurassic Park, and Amistad. In 1998 she Co-Produced the epic blockbuster Saving Private Ryan, for which she received the Producer of the Year award from the Producers Guild of America. Next came A.I. Artificial Intelligence, followed in 2002 by Minority Report, starring Tom Cruise. Fulfilling a longtime desire to work with a first-time filmmaker, Curtis produced The Chumscrubber with Lawrence Bender (Good Will Hunting, An Inconvenient Truth) for first-time director Arie Posin in 2005. The film starred Glenn Close, Ralph Fiennes and Jamie Bell and was an official selection for both the Sundance Film Festival and South by Southwest Film Festival as well as winning the “Audience Award for Best Film” at the Moscow Film Festival. Next up was Albert Nobbs, starring Glenn Close, Mia Wasikowska, Aaron Johnson, Janet McTeer, Jonathan Rhys Meyers and Brendan Gleeson, which Rodrigo Garcia (Mother and Child) directed in Dublin, Ireland. She produced the film with Close, Garcia’s longtime producer Julie Lynn and Alan Moloney (Breakfast on Pluto). The film received three Academy Award nominations. Following Albert Nobbs, Curtis partnered with Lynn under Lynn's production company label: Mockingbird Pictures. Since joining forces, the two have produced The Face of Love, which Curtis's Chumscrubber director, Posin, co-wrote and directed. The film stars Annette Bening, Ed Harris and Robin Williams, and was released March 2014. Following that came the release of 5 to 7, a romantic dramedy starring Anton Yelchin, Berenice Marlohe, Glenn Close, Frank Langella, Olivia Thirlby and Lambert Wilson. The film was written and directed by longtime TV-writer Victor Levin (Mad Men, Mad About You) and was released April 2015. Next came Last Days in the Desert, written and directed by Rodrigo Garcia, starring Ewan McGregor, Ciarán Hinds, Ayelet Zurer and Tye Sheridan. The film premiered at the 2015 Sundance Film Festival and was released by Broad Green in May 2016. The Sweet Life, directed by Rob Spera and starring Chris Messina and Abigail Spencer premiered at the 2016 Los Angeles Film Festival and was digitally released by The Orchard in April 2017. Curtis and Lynn next produced Wakefield, written and directed by Robin Swicord and adapted from an E.L. Doctorow short story, which was released on May 19, 2017 by IFC. The film starred Bryan Cranston and Jennifer Garner. To the Bone, written and directed by Marti Noxon, starring Lily Collins, Carrie Preston, Keanu Reeves and Alex Sharp was up next—the film premiered at the 2017 Sundance Film Festival and was acquired by Netflix for a sale of $8 million. Lori McCreary is the CEO of Revelations Entertainment, a film and television production company she and actor Morgan Freeman founded in 1996 with a mission to produce entertainment that reveals truth. The duo first worked together on McCreary's critically acclaimed Bopha! (Freeman’s directorial debut) in 1992. McCreary’s film and television credits include the Award-winning Invictus, 5 Flights Up, the groundbreaking documentary film about cancer, The C Word, and she is currently Executive Producer of CBS’s hit television series Madam Secretary starring Téa Leoni. She is Executive Producer of the highest-rated series in National Geographic Channel history, The Story of God with Morgan Freeman, as well as the expansion series The Story of Us. McCreary also served as Executive Producer of Discovery Science's Emmy-nominated series Through the Wormhole with Morgan Freeman, exploring how science pushes the boundaries of our understanding of the universe. McCreary is a unique combination: producer and UCLA-trained computer scientist. She maintains a passionate, ongoing dialogue with filmmakers, talent and executives to combat piracy, and works to change the landscape for diversity in film and emerging media. She is President Emeritus of the Producers Guild of America (PGA), founder of the PGA's Motion Picture Technology Committee, and served as a Co-Chair of the PGA Awards. McCreary sits on the Board of Trustees for the American Film Institute, is a member of the Academy of Motion Pictures Arts and Sciences, and has been profiled by The Wall Street Journal and featured in The Hollywood Reporter’s Most Powerful Women in Hollywood issues. Vanessa Morrison was named President of Fox Family in October of 2017 after serving as President of Twentieth Century Fox Animation since 2007. She previously operated as Executive Vice President at Twentieth Century Fox (live action), Senior Vice President of Production and Vice President of Production for the studio. Focusing on a wide range of family film projects (live action and hybrid) and animated kids television, Fox Family represents the studio’s commitment to growing its presence in the family film and television space, an important part of the unique variety TCFF offers to both filmmakers and moviegoers. Before the creation of the new Fox Family division, Ms. Morrison oversaw the 20th Century Fox Animation film Ferdinand from director Carlos Saldanha from Blue Sky Studios, which was nominated for the Academy Award® for Best Animated Feature. Prior to that the studio released Ice Age: Collision Course. With this fifth installment, the popular Ice Age series has amassed more than $3.2 billion worldwide to date, making it the highest-grossing animated franchise, internationally. In 2015, Morrison oversaw The Peanuts Movie, in which the gang we know and love from Charles Schulz's timeless Peanuts comic strip made their big-screen debut – like they've never been seen before, in state-of-the-art 3D and CG animation. Along with Reel FX Animation Studios, she oversaw the critically acclaimed Book of Life, produced by Guillermo del Toro, directed by Jorge R. Gutierrez, and released in October 2014. Earlier in 2014 came Rio 2, the follow-up to Fox Animation Studios’ 2011 hit Rio. Together, the films, directed by Carlos Saldanha, have grossed nearly a billion dollars worldwide. The 3D animated comedy-adventure Epic, directed by Chris Wedge, was released in 2013. Prior to that, Morrison oversaw the 3rd and 4th instalment of the Ice Age film franchise, which include the second and third largest worldwide grossing animated films; and the critically acclaimed Fantastic Mr. Fox. She also contributed to the success of the $295 million worldwide grossing, Dr. Seuss’ Horton Hears a Who!, an adaptation of Dr. Seuss’ beloved children’s book. During her tenure at Twentieth Century Fox (live action), Morrison spearheaded the production of Garfield: The Movie, Garfield: A Tale of Two Kitties, Cheaper by the Dozen, Cheaper by the Dozen 2, Dr. Dolittle 2 and Fat Albert. Morrison received her B.A. from the University of California at Berkeley and an MFA in Film and Television from UCLA. She has serves on the UC Berkeley, Chancellor’s Board of Visitors, and on the Women in Animation Advisory Board. In 2017, Morrison was recognized and honored on the Variety500 Most Influential Entertainment Business Leaders & Icons list; Black Enterprise’s 300 Most Powerful Executives in Corporate America list, and the Ebony Power 100 List. She also received the Ashley Boone Award from the African American Film Critics Association. Cheryl Boone Isaacs served three terms as President of the Academy of Motion Picture Arts and Sciences and 23 years as a governor representing the Public Relations Branch. During her tenure as a governor, she served as First Vice President, Vice President, Secretary and Treasurer as well as President of the Academy Foundation, the educational and cultural arm of the Academy. In 2012, Isaacs produced the Academy’s prestigious Governors Awards. Isaacs has been a respected motion picture marketing executive for more than 30 years. For the last nine years, her company, CBI Enterprises, Inc., has consulted for companies such as MTV Films, Paramount Pictures, Universal Pictures, Lionsgate, The Weinstein Company and Sony Entertainment. Her clients have included Troika Pictures, Andrew Lauren Productions, Linden Productions, Laika Entertainment, Film Bankers International, KTLA, Success Films, Robson Entertainment, Rangeland Productions, and Cube Vision. She has consulted on marketing efforts for films including The Call, The Artist, The King’s Speech, Precious: Based on the Novel ‘Push’ by Sapphire, Spider-Man 2 and Tupac: Resurrection. During her tenure as President of theatrical marketing for New Line Cinema (1997 – 1999), she developed and executed the campaigns for such films as Austin Powers: The Spy Who Shagged Me, the company’s highest grossing film at that time, The Wedding Singer and such critically acclaimed motion pictures as Wag the Dog, Boogie Nights and American History X. Largely through the efforts of Isaacs and her marketing team, New Line was one of only two studios to have four films - Lost in Space, Blade, Rush Hour, and Pleasantville – open No. 1 at the box office in 1998. Rush Hour’s $33 million opening was, at the time, the largest in the company’s history. Prior to joining New Line Cinema in 1997, Isaacs served as Executive Vice President, Worldwide Publicity, for the Motion Picture Group of Paramount Pictures. In 1995 and 1996, she orchestrated acclaimed publicity campaigns for Forrest Gump and Braveheart, each of which won multiple Academy Awards®, including Best Picture. In addition, the campaigns were recognized by the Publicists Guild of America as the “Best” in 1995 and 1996. From 1990 to 1994, Isaacs was Senior Vice President, Publicity, and held the title of Vice President, Publicity between 1986 and 1990. During her tenure at Paramount, Isaacs publicized the launch of such blockbusters as First Wives Club, Mission: Impossible, The Firm, Ghost, The Addams Family,Coming to America, Fatal Attraction, and the Beverly Hills Cop trilogy. Isaacs joined Paramount in 1984 as Director, Publicity and Promotion, West Coast, and was quickly promoted to Executive Director one year later. In addition to her long tenure at Paramount Pictures, Isaacs served as Director of Advertising and Publicity for The Ladd Company where she worked on The Right Stuff, Police Academy and Once Upon a Time in America. Prior to that, she spent five years at Melvin Simon Productions (The Stunt Man, Love at FirstBite, Porky’s) where her last position was Vice President, Worldwide Advertising and Publicity. She began her career in 1977 as a publicist at Columbia Pictures. In 2014, she was inducted into the NAACP Hall of Fame, was awarded the Trailblazer Award from Essence Magazine and was recipient of the AAFCA (African American Film Critics Association) Horizon Award. In 2013, she was honored by BESLA (Black Entertainment Sports Lawyers Association). Thank you Twyla Reed Martin, Sally Crockett, and Norm Miller for your generosity in supporting the 2019 Women in Focus Conference.